This drink is best enjoyed while relaxing outside and soaking up some much-needed vitamin D (porch swings are even better!). More sophisticated than your average cup of iced tea, this Pomegranate and Lime Iced Tea looks and tastes great, but is easy to make. This drink is best enjoyed while relaxing outside and soaking up some much-needed vitamin D (porch swings are even better!). It's also perfect if you're planning a Spring brunch. 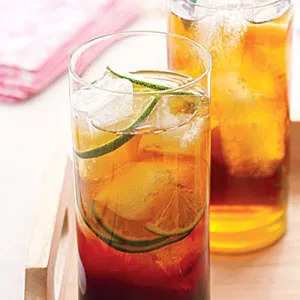 More sophisticated than your average cup of iced tea, this Pomegranate and Lime Iced Tea looks and tastes great, but is easy to make. If you can’t spend the day sipping tea outside, then pack up a picnic this weekend and tote a pitcher along! The fruity and refreshing beverage pairs perfectly with any of these 8 perfect picnic recipes. With only 59 calories and the delicious tartness of the pomegranate, an antioxidant powerhouse, you will be feeling better inside and out.